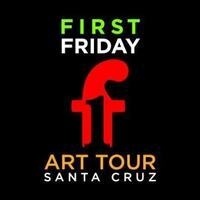 First Friday Art Tour happens every month, rain or shine throughout Santa Cruz. Each month First Friday is handing over the password to our Instagram. See First Friday through the lens of a different photographer each month and make sure to follow #FirstFridaySantaCruz on Instagram. Founded by the Santa Cruz Institute of Contemporary Arts, First Friday is an independent event designed to support a strong cultural environment through the promotion of Artists. and managed in conjunction with the participating Art venues, First Friday is a free event for enthusiastic Art Goers and an opportunity for our many talented Artists to exhibit and promote their work. We are proud to be working with the Good Times, our local weekly Arts and Entertainment paper in publishing the monthly listings each First Friday.